You’ve shot some awesome footage, but before you can start editing, your footage needs to make the journey from your memory cards to the hard drive. Bridge the gap and get your footage safely across with a good memory card reader. Indeed, many modern cameras have USB ports for transferring footage, but there are several reasons why you don’t want to do that. Aside from not being able to use your camera until the footage finishes copying over, data transfer speeds from the camera will usually be much slower, resulting in longer delays when offloading cards. A dedicated memory card reader is fast, affordable, and allows you to keep on shooting with a new memory card while footage from another card is being offloaded. This guide several different memory card reader options to help you find the best fit for your needs. We’re focusing on readers for SD cards as they are a common format for many shooters, but the concepts and options are the same if your camera uses a different type of media (CompactFlash, SSD, SxS, etc.). At least one card slot — one slot allows you to offload a single card at a time. Multiple card slots are preferred as they allow you to offload multiple cards at once. Speedy connection — USB 3.0 or Thunderbolt are good options that provide more than enough bandwidth to transfer footage from memory cards to hard drives as fast as possible. 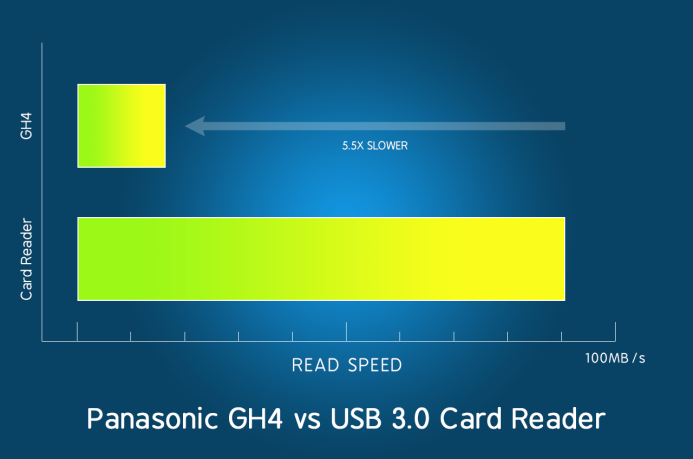 USB 3.0 is currently the most ubiquitous high-speed connection that works across various platforms (e.g. Windows, Mac, etc.). 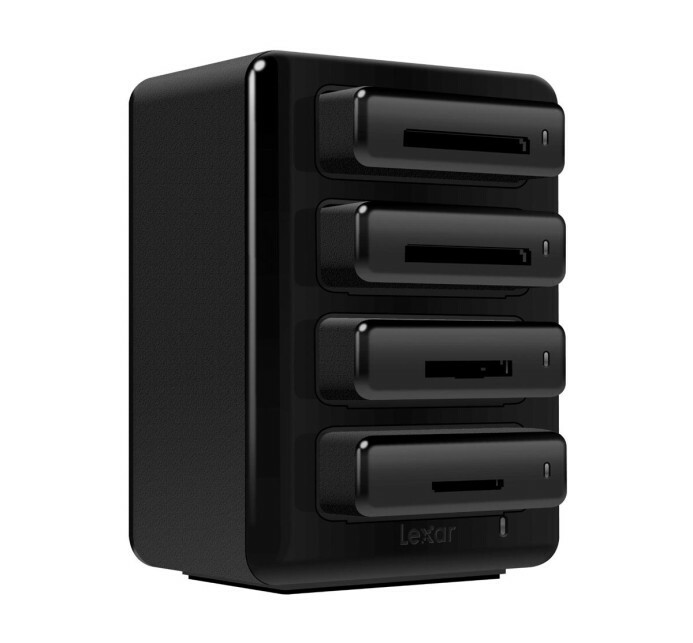 Multiple hard drives — at least 2 drives are required for offloading footage: primary and backup. Additional drives can be used to offload multiple cards more quickly or to create more backups for increased redundancy. Sufficient USB ports — make sure you have enough USB ports to attach your card reader and hard drives to the computer you’ll be using to offload footage. You can use a USB hub to add more ports if necessary (USB hubs are covered in an upcoming guide). Most laptops have an SD card reader built-in, so you may already have what you need to start offloading footage right now. The important thing is to make sure your laptop’s built-in card reader is cable of fast transfer speeds. 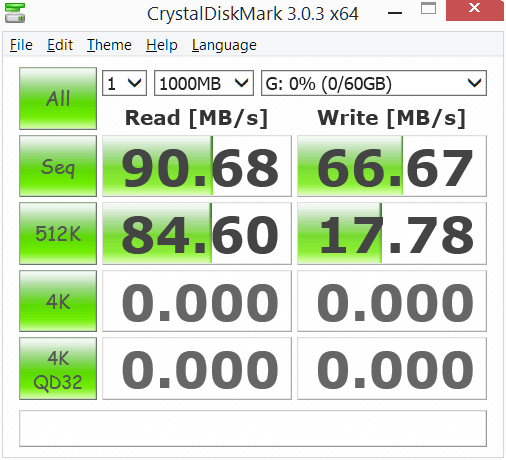 A high-performance U3 SDXC card should transfer footage at speeds of at least 60MB/s, so use a benchmarking tool such as Crystal DiskMark to ensure that your built-in card reader is not slowing you down. Fast — built-in card readers are hardwired directly into the computer, allowing for speedy transfers. Always with you — since it’s integrated right into the laptop, a built-in card reader can never be left back at the office or forgotten out in the field. Simple & Compact — a built-in card reader doesn’t require any additional cables and does not take up any extra space. Free — a built-in card reader saves you from having to buy a separate card reader. Tied to the computer — a built-in card reader cannot be disconnected and used with another computer, so when you upgrade your laptop, you lose the card reader. One card at a time — most laptops only have a single built-in card reader, allowing you to offload only one card at a time. Single card format — most laptops have a built-in SD card reader. Other card formats (e.g. CF, SxS, P2, etc.) will require a separate reader. Not upgradable — new card variants (e.g. SDXC, etc.) may not be supported by a built-in card reader if they are introduced after your laptop is released. Bottom line: As long as it’s fast enough and compatible with your memory cards, using the card reader built into your laptop is one of the simplest ways to start offload footage. What it lacks in versatility, a built-in reader makes up for in simplicity. If your laptop’s card reader is too slow or missing entirely, a dedicated card reader is your next option. While you can pick up single-slot card readers for the card format you currently use, multi-format memory card readers are highly recommended as they allow you to offload the cards you use today as well as those you may use in the future. 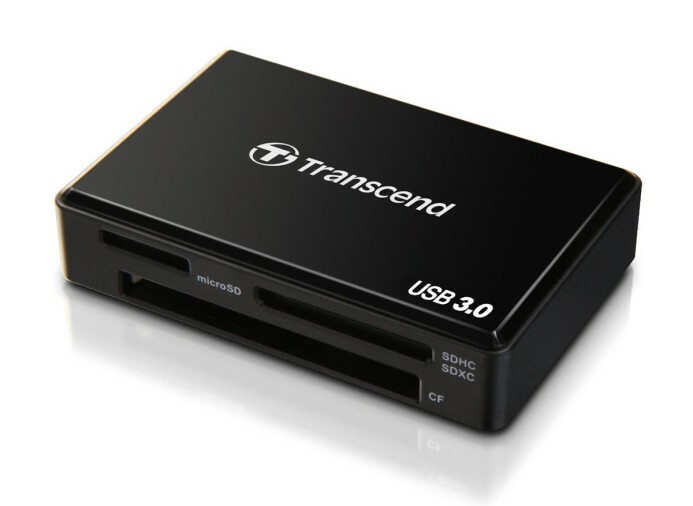 For example, Transcend’s USB 3.0 multi-format memory card reader can read multiple memory card formats including SDXC and CF. These dedicated card readers connect to your computer’s USB 3.0 ports to provide fast transfer speeds. Also, while these card readers only include one slot per card format, at only about $13 a pop, you can get multiple readers for offloading multiple SD cards at once. Compact & Portable — despite providing access to multiple card formats, dedicated readers are small and do not add a lot of bulk to your setup. Affordable — only about $13, a dedicated card reader lets you offload footage quickly without breaking the bank. Versatile — multi-format card readers support a variety of card types, saving you from having to buy a new reader when you need to offload a different type of card. Computer-independent — a dedicated card reader can hop from computer to computer, allowing you to use it with any setup. One card at a time — most dedicated card readers only have one slot for each card type, so you’ll have to get multiple readers if you want to offload multiple SD cards at once. Separate accessory — unlike a built-in card reader, it’s possible to lose a dedicated card reader if you’re not paying attention when packing up your gear. Bottom line: A dedicated memory card reader is an affordable option for quickly offloading footage. Multi-format card readers give you greater flexibility in the types of memory cards you can work with. The main problem with the above card reader options is that you can only read one card at a time. Sure, you can always buy multiple card readers, but you’ll need to take up a separate USB port for each reader. 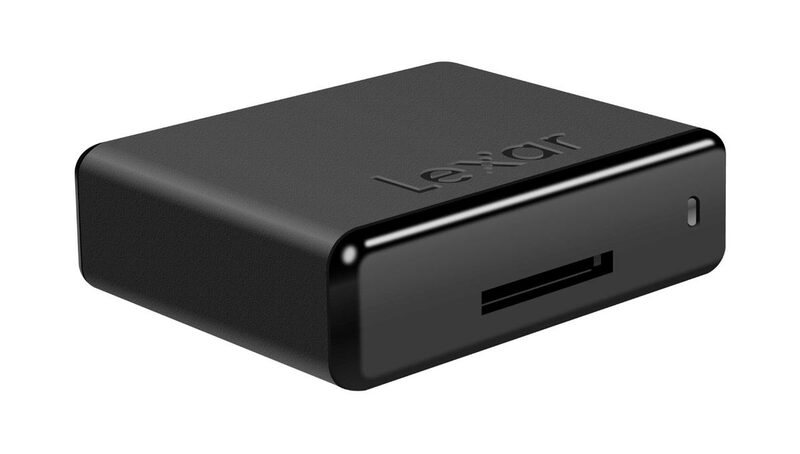 If you need to offload multiple cards, a better solution may be a modular card reader like Lexar’s HR1 hub, which allows you to offload up to 4 memory cards simultaneously via a single USB 3.0 port. There are modules for a variety of card formats available for the HR1, allowing you to mix and match modules according to the media being used on each project. For example, if you’re shooting with multiple Panasonic GH4 or Sony a7S II cameras, you can configure the HR1 with 4 SD card modules. If you’ve got a Blackmagic URSA Mini in the mix, add a CFast module and you’re good to go. You can even add SSD drive modules to the HR1, giving you card readers and storage in a single unit. Modular — configure the hub with the perfect combination of modules for each project, using as many or as few modules as necessary. Standalone — working on a small project where you only need a single card reader? Each module can be plugged directly into the computer via USB, so you can leave the hub at home to cut down on bulk in your gear bag. Future-proof — upgrade modules as you use new memory card formats in your projects. Modules are a bit spendy — modules start at about $25 (SD) and can cost as high as $90 (CFast 2.0). This is expensive for a single reader, and can really add up for a full set of modules. Dependent on Lexar — you’re at the mercy of Lexar to decide whether its worth continuing to develop modules for new memory card formats. If they stop making modules, or don’t make modules for the formats you use, the HR1’s usefulness is limited. Bottom line: Lexar’s modular hub is a great concept, especially if a clean setup and preserving USB ports is a priority. Things can get pricy for a fully-decked out hub (e.g. $150 for the hub with 4 SD card modules), but you can always start out with just a single module ($25) and build up from there as your needs grow. A USB 3.0 hub with a built-in SD card reader? Sounds like the best combo ever! A combo device like this would seem to give you everything you need– ample USB 3.0 ports for connecting your hard drives and a card reader for offloading footage. There just one problem: a combo unit doesn’t have enough power. These combo units are bus-powered, so they get all of their power from the computer’s USB port. As such, performance and stability can vary greatly depending on how many drives you have connected to the hub and each drive’s power requirements. Everything may seem to be working just fine at first, but performance and connectivity issues can often occur once things start to get going. Practically, this means your hard drives could disconnect from the computer right in the middle of offloading footage. Instead, if you’re using bus-powered portable hard drives, using a separate USB port for each drive is highly recommended. Alternatively, using a self-powered hub with its own power supply is also a good option for providing enough power for all connected devices. 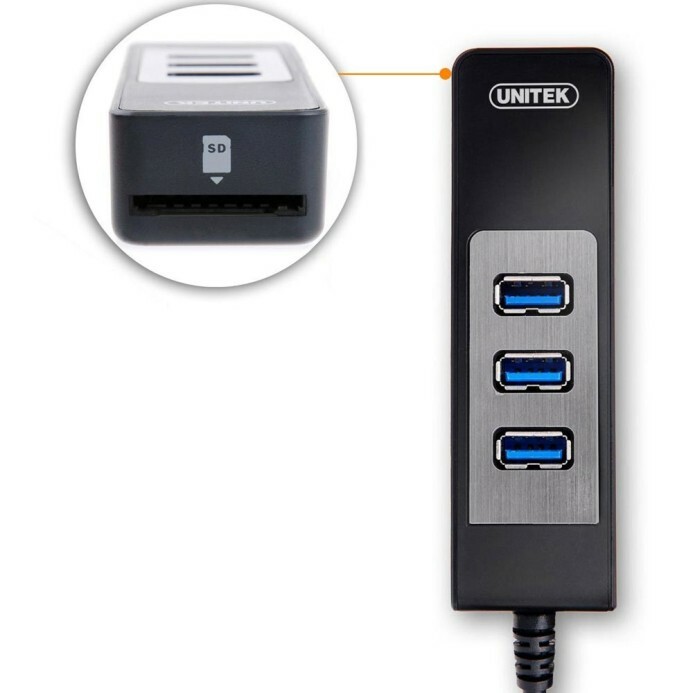 Bus-powered: Amazon 4-Port USB 3.0 Hub — can add a few additional USB 3.0 ports in a pinch as long as you don’t overload the hub with power-hungry drives. I’ve connected two bus-powered drives for offloading in the field, though your drives may have different power requirements. Self-powered: Plugable 7-Port USB 3.0 Hub — features its own power supply for running multiple bus-powered hard drives simultaneously. You’ve invested the time and money on a good camera and high-quality memory cards, but don’t stop there. A good quality card reader does not need to break the bank, so make sure you choose a good one to make your offloads fast and smooth. Built-in reader — a good place to start since many laptops already have a card reader built-in, though performance and compatibility can vary from manufacturer to manufacturer. Multi-format reader — an affordable option that gives you access to multiple card formats. Modular reader — offload multiple cards from a single unit, though a fully-configured setup can be expensive. USB Hub/Card Reader Combo unit — no. As this data management workflow series continues, we’ll dig into what to look for when choosing a USB hub, the best offloading software to use in the field or back in the studio, and more guides to ensure that every frame of video you shoot makes it to the edit bay safe and sound. Sign up below to receive free updates on this series and other exclusive tips and resources.